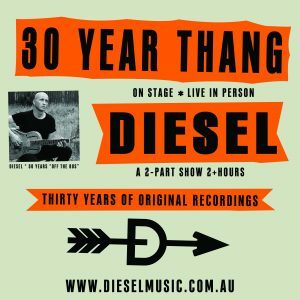 2017 marks 30 years since Diesel literally stepped off the bus after making the Nullarbor crossing from Perth with his band Johnny Diesel And the Injectors, a “hobby” band made up of remnants of an imploded previous band. So, what better way to celebrate than with a night that combines a 25th Anniversary commemoration of Diesel’s breakthrough #1 solo album “Hepfidelity”, with hits from a 30 year career to date. Hepfidelity – Through The X-ray will see Diesel retracing tracks from the album that established him as a solo artist and musical traveller. Diesel Rewound is where we get to ‘rewind’ through the hits of a 15-album career, that has produced 35+ singles.